At the age of five, Martha Berry’s mother and grandmother began teaching her to use a needle and thread. By nine, she was making her own clothes, and at twenty, she was a seamstress for a touring ice show. Born and raised in northeastern Oklahoma, to Cherokee/English/Scotch-Irish parents, she took her Cherokee heritage largely for granted for many years. In her forties, with her children nearly grown, she began to discover the richness and importance of her ancestors’ experience, and turned her skill with a needle to beadwork. In just six years she has become an award winning Cherokee beadwork artist, whose work has been displayed in numerous art shows and museums. Martha Berry’s beadwork is inspired by the styles of the Southeastern Woodland Native American Indians, including the Cherokee but also the Creek, Choctaw, Chickasaw, Seminole, Yuchi, Alabama, etc. Her beadwork often illustrates the stories and lore of her Cherokee ancestors. Her pieces include custom made bandolier bags, moccasins, baldrics, belts, and much more. Martha Berry is an active citizen in the Cherokee Nation, and served as a delegate in the 1999 Cherokee Nation Constitutional Convention. What follows is an interview that Mrs. Berry graciously conducted with All Things Cherokee in January 2001. 1) What inspired you to begin beading, and in particular, why Cherokee beadwork? I am more of an artist than a scholar, so there was no question that from the beginning, I would have to find a way to express myself by doing some type of Native American artwork. Since I learned to do hand needle work as a little girl, beadwork was a natural choice. 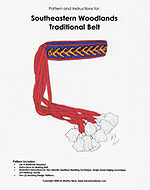 But, when I began to do this work, I did not even know that there was such a thing as Southeastern Woodlands beadwork. I had never heard of bandolier bags or sashes or men’s garters. I had much to learn. I began by doing typical plains style beadwork, like you see so much of today. I have a great respect for that work and enjoyed doing it. You know, gourd stitch, lazy stitch, etc. Then, one day several years ago, I was on the telephone with Chad Smith, who later became the Principal Chief of the Cherokee Nation. He and I were discussing the constitutional crisis that was going on in the Nation at that time and what, if anything, I could do to help. Those who are at the forefront of teaching our culture are our artists and crafts people. People like Martha Berry, Lena Blackbird, Anna Mitchell, Knokovtee Scott, Bill Glass, Talmadge Davis, Mary Adair, and many others memorialize and teach our culture and traditional arts. But as each of them know and would tell you, their Cherokee projects must be historically accurate and culturally true; otherwise, they have compromised the value of their work. I felt so dumb. I did not even have an answer for him. I knew so little, I did not really know what he was talking about. I vowed right then and there that I would learn all I could about the beadwork of my Cherokee and other Southeastern Woodlands grandmothers, and that I would never be without an answer to that question again. I began studying and creating Southeastern Woodlands beadwork and have never looked back. I am hooked. 2) What has inspired or contributed to your work along the way? Many, many things, of course. But, I remember one thing in particular. About 2 1/2 years ago, I wrote to all of the prestigious museums back east (Smithsonian, etc.) and asked if they would send me copies of photos of Cherokee beadwork, as well as photos of Cherokees wearing beadwork. When they arrived, I had a good number of photos of bandolier bags and sashes and moccasins. But, every photo of Cherokees wearing beadwork was taken after 1907 and in every single photo the Cherokees were wearing plains beadwork. As I said, I have great respect for plains beadwork, but I thought it a shame that Cherokees had so completely abandoned their style of beadwork. The other single most important event was a grant enabling me to go to Washington, DC, to study the Southeastern Woodlands beadwork in the Smithsonian Institution collection. That was just a couple of months ago and it will probably take years to realize how deeply that opportunity affected me. It was amazing to see and feel and even smell those wonderful old pieces of beadwork. 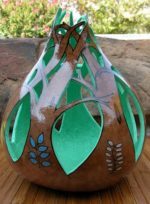 It has already influenced my choice of stitch techniques, my choice of fabric color, and has sent me on a quest to find one certain color of beads that must have been common back then. 3) Have there been any turning points which you believe have lead you to where you are today? I would have to say the conversation with Chad Smith probably did more than any other single event. That is what started me down this path. I will be forever grateful to him for asking that one little question. 4) To what extent do the traditional Cherokee beadwork patterns and practices influence or affect your work? Except for certain requests from collectors to do otherwise, I endeavor to always create work that is as much like the old Southeastern work as possible. I am, of course, learning more and more every day. So, my work changes and improves daily, too. For example, I am now trying to find time to create a pair of men’s garters (or knee bands) that is more like some of the ones I saw in Washington and have seen represented in paintings. But, it all takes time and I will, eventually, get to it. 5) Is there anything that frustrates you about this work? There is a quote: “Art is long and time is fleeting.” To me it means that the inspiration and beauty of art lasts long after the artist and his or her time has passed. But, it also describes the frustration of having so many ideas popping into your head and just not having the time to create them all. This work is very time consuming. I happen to enjoy that, getting lost in the detail of a piece of beadwork, etc. But, if I worked around the clock for the rest of my life, I could never get all the ideas beaded. 6) What is your hope for the future of Cherokee beadwork as an art form? Do you see it becoming a more widely practiced form of art? I will take these two questions together as they are interdependent. My hope for the future of Cherokee and Southeastern beadwork is for there to be a good, strong, market for it. That will only happen if people know what they are looking at when they see it. Currently, the average person can recognize plains beadwork on sight. They see it as being Native American and they have come to expect this look when they look to buy a piece of beadwork. What I would like to see is for Cherokees, and other Southeastern descendants, to be able to see a piece of Southeastern Woodlands beadwork and know that it is the beadwork of their own grandmothers. I would love for a bandolier bag to be as indicative of Southeastern Woodlands nations as a totem is of Northwestern nations or a kachina is of the Southwestern nations. We need this visual identity. Martha Berry has created several beadwork patterns which you can follow to create your own beadwork.